One of the many penalties heaped on Penn State’s football program as punishment for university officials covering up child abuse was the “vacating” of several years of football victories. The vacated victories were all football games won during the tenure of saint turned scumbag head coach Joe Paterno. 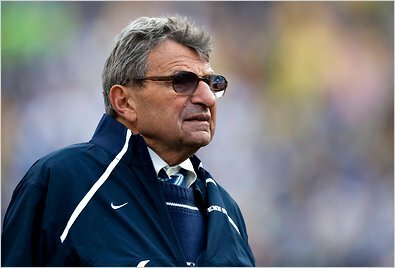 Paterno fell from grace when it was revealed that he kept quiet though he knew that one of his staff had been luring little boys into showers. Fortunately for Paterno, he died and was spared the heartbreak of seeing his victories vacated. The Penn State situation is identical to the ongoing sexual abuse coverup scandals in the Catholic Church. It’s hard to say if the Church is like a Football Program or if a Football Program is like the Church. I don’t want to offend either. It probably doesn’t matter because in both cases it’s about high officials in a powerful hierarchical organization protecting the organization’s sanctity by hiding the sins of underlings against those the organization is ostensibly set up to benefit. Something like that, anyway. When I heard about the vacated victories I did some research to find out what, exactly, vacating consists of. “Vacating, ” one sports expert explains, “does not have the same effect as a forfeit, which would award the victory to the other team. Instead it just leaves the game in a strange limbo in which it is treated as if it wasn’t officially played.” Limbo may be the key word here. Joe Paterno’s statue has been removed and his victories have been vacated. The vacating of victories seems like a strange punishment to me. In its effort to punish a dead coach, the NCAA vacated the result of games played by many hundreds of young football players who had nothing to do with covering up child abuse. These young players, most of them still alive and proud to show their trophies, are, after all, the ones who played and won the games, not dead Joe Paterno. To a cleric, it would seem to me, though I confess to knowing little of such things, the equivalent of a football victory is the salvation of a soul. That is the Ultimate Victory from the viewpoint of the Church. Therefore, I, Tiger Tom, propose that in the many cases where clerics are found guilty of concealing the abuse of children the Ultimate Penalty be the vacating of the baptism of all those baptized under the auspices of said cleric. This is only fair. In the recent (2012) case of Msgr. William J. Lynn, a former aide to the archbishop of Philadelphia who was found guilty of looking the other way while young boys were being abused, I think it would be fair to vacate the baptism of all Catholics in the area of his jurisdiction who were baptized and therefore saved from eternal torment during the time when the Monsignor knowingly withheld information. Vacating their baptism, of course, would not mean that they were doomed to Hell. It would be simply as if they had never lived. The Monsignor is the one who would really suffer, seeing his record as a soul saver reduced to the number of baptisms that occurred before his fall. If Joe Paterno can give up his victories, surely a few Catholics, especially if they are football fans, won’t mind giving up the salvation of their souls. Sometimes collateral damage can’t be avoided, as they would say at the NCAA.